KENNETH CHAU’S RESEARCH is highly relevant to modern society, he says, because light—and more generally electromagnetic waves—form the basis of how we see the world, display information, and communicate over large distances. Dr. Chau has several research projects on the go, including a portable microscope that may speed up medical diagnostics, and a prototype for a non-invasive wearable device that will monitor blood pressure in real time. He’s already making contributions. Chau won the student-voted School of Engineering Award for Excellence in Teaching three years in a row, and continues to innovate with graduate students in his electromagnetics and optics lab, exploring technologies that may start new companies and industries. 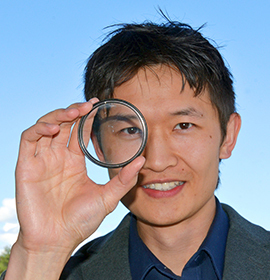 One of the highlights of Chau’s UBC career so far was the publication of research on flat lenses in the scientific journal Nature. Chau was part of a research team with leading scientist Henri Lezec and colleagues at the National Institute of Standards and Technology (NIST) in Maryland, US. The team developed a substance that can be affixed to surfaces like a glass slide and turn them into flat lenses for ultraviolet light imaging of small objects like biological specimens. It could revolutionize the way optical lenses are made and used. Starting at the School of Engineering during its nascent years meant that Chau could not leverage pre-existing laboratory resources, mentorship from experienced faculty, and brand awareness amongst graduate students. As a result, he outfitted his electromagnetics and optics lab and recruited high-quality graduate students, who are now making strides with difficult research. “I have slowly learned that the best and most important research comes from tackling hard and worthwhile problems,” Chau says. “Going for the ‘highest-hanging fruit’ is higher risk, but the payoff is well worth it. Along with his mentors Lezec and Ying Tsui, and early masters such as James Maxwell and Michael Faraday, Chau credits a new wave of engineers for helping his progression.